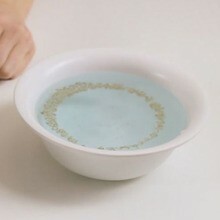 With this experiment, you will discover interesting properties of air and heat. You will even learn how to make a fountain! 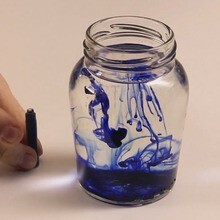 This experiment uses thermal expansion. When you pour hot water on the bottle, the air inside becomes warmer, and expands. This means that its volume increases, and takes more space than when it was cool. The water, that has nowhere to go in the bottle, gets expelled through the straw. As you put the bottle in the refrigerator, the reaction is even stronger. The cold air gets warm very quickly. 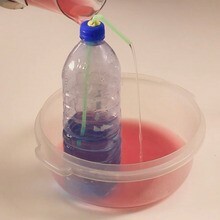 Fill half of the bottle with water, and leave it in the refrigerator while your preparing the rest of the experiment. Ask an adult to make a hole in the cap of the bottle with a thumb tack, and to make it bigger with a strong enough pencil. Put the straw through the cap, and make the hole airtight with removable adhesive. Take the bottle out of the refrigerator, put the cap back on it. The straw must be in the water. Then, put the bottle in the basin. Ask an adult to fill the jug with hot water, and to pour it onto the bottle. Very soon, you will notice that water is coming out through the straw!